DECIEM’s 5 Piece Heroes Collection, First Ever TSV on QVC! Well it has finally happened!! Deciem are doing their first ever TSV on QVC on the 23rd of January (pre-sale at 10am) .. Yikes! So they are calling this a beauty box and it show cases some of their best products across the vast umbrella of products that they now do. So whats in the box you say! Well the first product is the AHA30% & BHA2% Peeling solution 30ml. Oh this is the most fabulous beetroot red shade, definitely very unique and it is a really good product for exfoliating the skin and it is also really good for clearing out and dissolving the dirt in pores too. I have found this mask leaves my skin incredibly smooth, brightened and conditioned. It is different to anything else I have used due to the colour but that is a part of the fun of the mask, skincare should be fun at times.. Grab a glass of vino and go for it .. your skin will thank you in the morning! (even if your head is sore). Next up is NIOD MMHC2 – Multi-Molecular Hyaluronic Complex 2, 30ml, this is the updated version of MMHC and it has 15 different Hyaluronic compounds, precursors all in a highly charged peptide delivery system. This product hydrates the skin on a multi dimensional level – in other words it doesn’t just hydrate the top layer of skin it goes down & hydrates the skin on many different levels and layers plumping it up and keeping it hydrated all day. I have been using this since it came out. I was caught in the stampede and I didn’t care I wanted some! Particularly good if you are stuck on the North West Coast of Ireland and it is baltic and the heating is on full blast, a product as good as this is a must! The Chemistry Brand Hand Chemistry – Hand Cream this is skincare usually reserved for your face in a hand cream. It is completely anti-ageing and the results are fantastic! If your hands are dry and you can see them starting to age.. get this on and put some gloves on top at night and you will have hands that look 10 years younger by the morning, brighter, more youthful and silky soft .. Oh yes please! Hylamide HA BLUR – Oh wow! I have just tried this product and I am amazed at how my face looks and feels, it looks younger, smoother and velvety smooth. I tried some on my hand too to really see if I could see what it does and I can! Results are immediate and my hand looks smoother and younger. No wonder this has won awards it is a really remarkable product .. why did I not pick up on this before? I have a new love for sure .I do know of others in my beauty group who have tried this and swear by it but I had never gotten round to trying it as well .. so many products Deciem now sells! Ha Blur is a prismatic blurring surface finisher, you can use it under your makeup as a primer, mix it in with your foundation to give flawless finishes. and you can also take a little and tap it on gently to areas of concern that you want to Blur like your number 11’s, corners of mouth and really you just dab a very small amount where you need it. You can also just wear it on bare skin to give you a ‘softer focus’ complexion. It also has Hyaluronic Acid in to keep skin glowing, the results are truly amazing. Last up but by no means least is Multi-Molecular Hyaluronic Acid from the Fountain range , 240ml – I LOVE these vitamin drink suppliments and I have 3 on the go right now including this one (God bless Black Friday lol) Again this is an award winning product it tastes lightly of ginger and it is packed full of Hyaluronic acid. 2 teaspoons a day in juice or water ect .. i just take mine off the spoon and have a glass of water after. I really do feel my skin is in better condition all over for taking this. What I love about this is it not only benefits your skin but your whole well being, joints, bones, skin the lot so I love that is is multi purpose and vegan. All of Deciem’s products are cruelty free & lots of them are vegan,some are organic, they are carving their own path in the beauty world and are not afraid if they don’t like something not to do it. Their aim is to bring the consumer the best and most innovative products that they can, I like clean beauty but I also like some good science behind a product too and Deciem offers me this by the bag full. This is a fabulous TSV the value combined of products is £110 and on the 27th of January it will be just £39.96 which is exceptional value! I will put the link here when it goes live and that’s it for now ..Deciem 5 Piece Hero’s Collection! Will you be treating yourself to this cracking TSV? 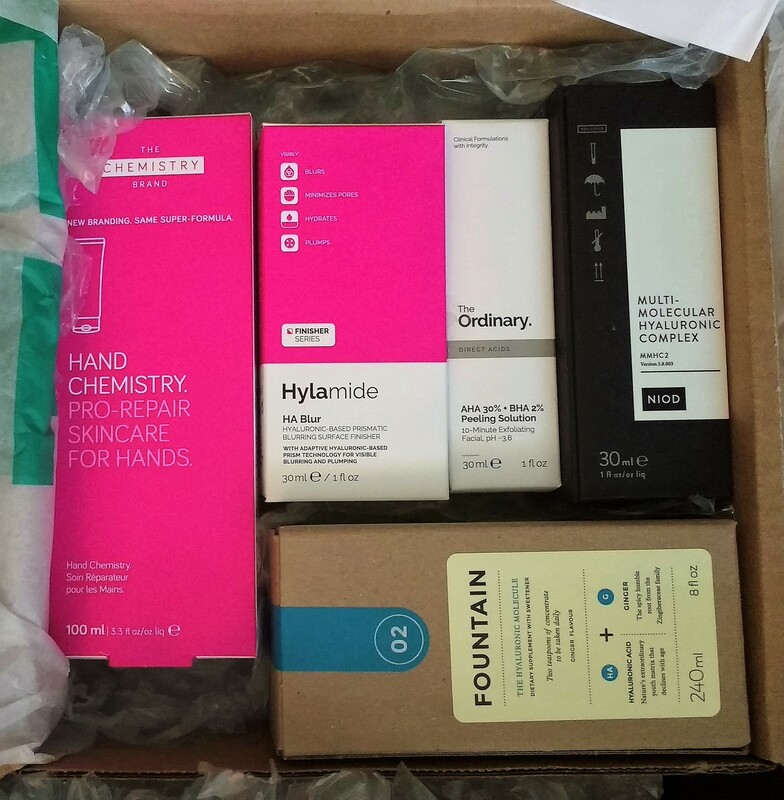 This entry was posted in Health & Beauty, Health and Beauty and tagged AHA30% & BHA2% Peeling solution, Anti-ageing, clean, cruelty free, Deciem, flawless, Hydrating, Hylamide HA BLUR, makeup primer, MMHC2, Multi-Molecular Hyaluronic Complex 2, Niod, Peptides, prismatic blurring surface finisher, QVC, Skin plumping, soft focus, The Chemistry Brand Hand Chemistry. Hyalimide Hand Cream, The Ordinary, TSV, Vegan, wellbeing on January 21, 2018 by the40somethingbeautyblogger.